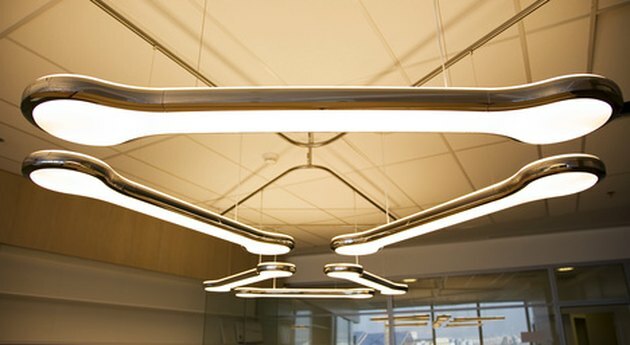 Fluorescent light fixtures may be the best option for lighting large rooms such as offices and classrooms, but they can emit an unpleasant spectrum of light, and the fixtures themselves can be unattractive. Luckily, even if removing and replacing the ceiling fixtures isn't possible, you can make them look better by covering them up or otherwise disguising them. Some fluorescent fixtures are more stylish than others. The easiest way to draw attention away from an unattractive fluorescent ceiling fixture is to stop using it. Place lamps and light fixtures around the room and use them for indirect lighting; providing alternative lighting sources allows you to cover up the offending fixture. Remove the light bulbs if you don't plan to use the light; that way you don't have to worry about heat from the fixture causing a fire if someone uses it after you've covered it up with potentially flammable material. Decorative light panels are available commercially to fit a variety of square and rectangular fluorescent light fixtures. These fiberglass, glass or plastic panels are printed with brightly colored designs. Adding a decorative panel that looks like a bright blue sky can turn an ugly and unwanted ceiling fixture into a work of art. This option does not require changing the light fixture, making it a sensible option for renters. A sheet of cream-colored rice paper can hide the ceiling fixture and diffuse the green-toned light an older fluorescent bulb produces. You can pin the paper around the fixture, but make sure you allow plenty of clearance between the paper and the fixture. This will prevent the heat of the lights from scorching or burning the rice paper. Simple pins or thumbtacks will work on most ceilings, or removable adhesives can be attached to the inside of the paper if the plaster is fragile. Round fluorescent light fixtures featuring circular bulbs are much easier to cover and hide than the large rectangular ones. Large glass light shades, usually seen on incandescent ceiling fixtures, can cover a fluorescent fixture if it features the center post these shades attach to. A properly shaped paper lamp shade can also be used with some slight modifications, according to Apartment Therapy. The paper Chinese lanterns typically used to hold candles can, when cut in half, fit over and hide a round fluorescent fixture. If the glaring light of the fluorescent bulbs or dingy look of a worn fixture cover is what you're trying to hide, a simple diffusing filter works great. The Calloway House website says that these woven nylon sheets are flexible enough to fit around any shape of ceiling fixture. They come in various colors, including blue, that are designed to balance the light spectrum emitted by the fixture. Some models have magnets sewn in for easy installation and removal.